Supermarket chain Aldi has invested in a range of ready meals aimed at the growing volume of high spending tourists from China’s emerging middle class visiting Scotland. A study by VisitScotland has revealed that the three most popular items on Chinese visitors’ itineraries are: ‘To see the Loch Ness monster’, ‘Play the bagpipes’ and ‘Eat Haggis’. 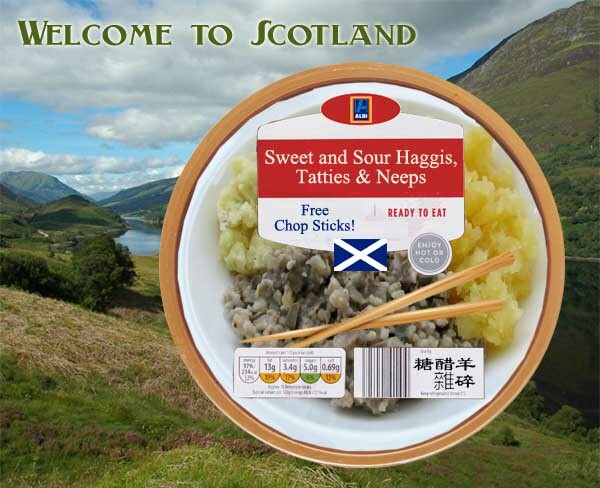 The first ready meal to hit Aldi shelves next week is ‘Sweet & Sour Haggis with tatties and neeps’ which includes chop sticks and a biodegradable bib.